U.S.-backed Iraqi army units on Wednesday took control of the last major road out of western Mosul that had been in Islamic State’s hands, trapping the militants in a shrinking area within the city, a general and residents said. The army’s 9th Armored Division was within a kilometer of Mosul’s Syria Gate, the city’s northwestern entrance, a general from the unit told Reuters by telephone, reports Reuters. Mosul residents said they had not been able to travel on the highway that starts at the Syria Gate since Tuesday. The road links Mosul to Tal Afar, another Islamic State stronghold 60 km (40 miles) to the west, and then to Syria. If they defeat Islamic State in Mosul, that would crush the Iraq wing of the caliphate declared by the group’s leader Abu Bakr al-Baghdadi in 2014 from the city’s grand old Nuri Mosque. The U.S.-led coalition effort against Islamic State is killing the group’s fighters more quickly than it can replace them, British Major General Rupert Jones, deputy commander for the Combined Joint Task Force said. With more than 45,000 killed by coalition air strikes up to August last year, “their destruction just becomes really a matter of time,” he said on Tuesday in London. The U.S. commander in Iraq, Lieutenant General Stephen Townsend, has said he believes U.S.-backed forces will recapture both Mosul and Raqqa, Islamic State’s Syria stronghold in neighboring Syria, within six months. 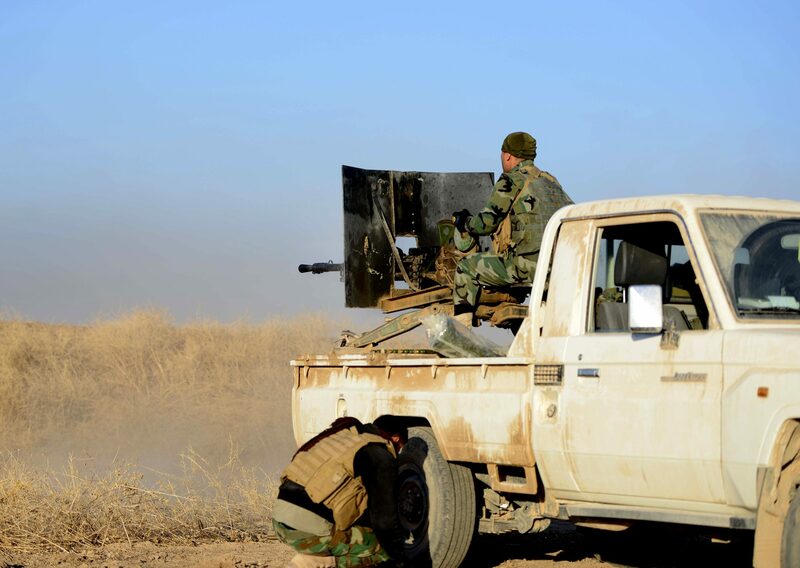 The closing of the westward highway meant that Islamic State are besieged in the city center, said Lt General Abdul Wahab al-Saidi, the deputy commander of the Counter Terrorism Service (CTS), deployed in the southwestern side. Units from the elite U.S.-trained division battled incoming sniper and anti-tank fire as they moved eastwards, through Wadi al-Hajar district, and northward, through al-Mansour and al-Shuhada districts where gunfire and explosions could be heard. These moves would allow the CTS to link up with Rapid Response and Federal Police units deployed by the riverside, and to link up with the 9th Armored Division coming from the west, tightening the noose around the militants. “Many of them were killed, and for those who are still positioned in the residential neighborhoods, they either pull back or get killed are our forces move forward,” Saidi said. Two militants lay dead near the field command of the CTS, in the al-Mamoun district which looked like a ghost town. A few hundred meters away, a car bomb was hit by an air strike.